Before going to mountain bike buyers guide, lets start with the basic. This guide is written based on answers of the popular questions come first in anyone's mind. 1 What is mountain biking? 2 Why mountain biking is so amazing? 3 How Can I Start? 4.1 What is a suspension bike? 4.2 How suspension system works? Why mountain biking is so amazing? There are many reasons why mountain biking is so amazing, and getting a great workout is just the beginning. Not only you will get several different areas of your body worked out, but you'll also have a lot of fun while riding. Another great reason is, if you want to, it can be just you and the great outdoors. You can just ride and enjoy the scenery and smells. On the other hand, it allows you to make a group event and have some great memories. In terms of terrain, you will end up visiting a lot of different places since the different terrain is located around the country. With that being the case, you also have the chance to meet new people and make new friends. The amazing part, this lead to having annual or semi-annual riding groups all over the country. Finally, you'll be able to face all your fears and get a boost of confidence. The reason is because riding on very rough terrain takes a lot of bravery because you never know what could happen. This is also true of areas you've never been because you don't know the terrain at all. Now that you know some of the reasons why mountain biking is so awesome, you're probably wondering how you can get started. It's relatively simple but you do need to learn a few things for starting like a pro. To begin, you want to make sure you get a mountain bike that is the right size. You don't want one too small or too big bike because you won't be able to ride comfortably. There are the different types (based on suspension system) of mountain bikes explained bellow. Rigid: These have no suspension so there's less mechanical issues but it's harder to use off-road. Hardtail: It has a fork on the front wheel and a rigid back wheel. It's great for beginners. Full-Suspension: These are the most expensive but they have suspension in the front and back which makes them great for off-road. The next thing you want to get is a helmet that fits properly. You really don't want to go without because one hard crash could really mess you up. Finally, you want to get safety gear. This is one of the most common mountain bike accessories. Some of the common gear is listed below. What is a suspension bike? The first thing you need to know is what a suspension bike is and how it works. There are many different types of bikes but the ones with full suspension seem to be the most expensive. They are also the best for mountain biking. 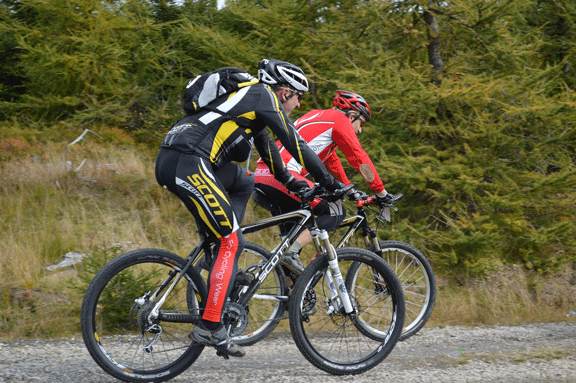 There are two main types of mountain bikes that have suspension. These are ones with partial, aka hardtail, and full. They are both great for mountain biking but the one with full suspension is top of the line. The hardtail mountain bikes are the ones that have partial suspension. They have the normal bicycle setup but have a suspension fork in the front. This means that the suspension doesn't work for the back. The full suspension mountain bikes have the same front fork but the actual bike is made from two different pieces. These pieces are then joined by pivots. This means that there is suspension in both the front and back. When looking at which type is better, you have to look at what the suspension does. The hardtail is great for beginners since they won't be on a lot of crazy terrain, while the full suspension is great for more advanced riders because it's more capable of performing on areas with a lot of bumps and dips. Now that you know what these suspension types are, you need to know how they work. Regardless of the type of suspension the bike has, they are going to have a shock absorber. This is made up of the spring and damper. The spring is what makes the wheels move up and down when you hit a bump. This helps you navigate over the bumps easily and helps reduce the risk of you flying off the mountain bike. The damper is what keeps the spring from bouncing all over the place. These two things together really helps make your ride much easier. The next thing you need to know about is the different gears on a mountain bike. Mountain bikes can have up to 33 different gears and the number actually depends on how many sprockets and chain rings there are. For example, 4 chain rings and 10 sprockets means there are 40 speeds. The reason a mountain bike needs gears is so you can maintain a comfortable pedaling speed. For instance, you'll need a different speed for going up a hill than you would for going down the hill. You want to make sure both of these situations has the correct speed to do it easily. Now that you know why they're important, you need to know the different kinds. The most common are: standard double, triple, and compact. All of these have to do with how many chain rings there are. In terms of how gears work, it's a pretty simple mechanism. While every bike manufacturer is going to have a different way of shifting, the majority of them are located on the handle bars. Most of the time, there will be a lever that you pull once or twice in order to change gears, which means you can change them quickly and efficiently. Another thing you need to know before mountain biking is how to find the bike that is the perfect fit. You don't want one that's too small or too big. You should find a bike that lets you have the following things. In all time, you should have relaxed shoulders, slightly bent elbows, and slightly bent knees. Another important thing, you also want to make sure you sit on the seat comfortably and that the frame is the right size while the brakes and gears are easily accessible. A good rule of thumb is to actually sit on the bike and make sure you fit comfortably and you can reach everything you need to. You can also read fit guide from amazon. The final thing you need to know is what kinds of mountain bikes there are. Generally speaking, there are 5 main types that are the most common and each type is going to be great for certain things. 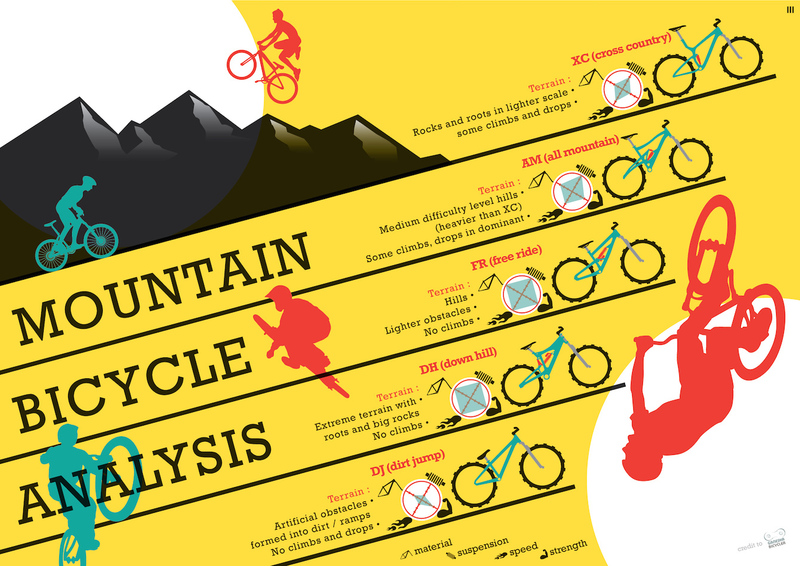 This should help you decide how to choose a mountain bike and below are the different types of mountain bikes explained. The first type is the cross country mountain bike. These are the most common ones and they are the most common ones available in stores. These bikes are built lightweight and are used for speed. There are two main types of cross country bikes. These are race bikes and trail bikes. The race bikes are very lightweight and fast while the trail bikes are a little heavier and are great for rough terrain. The next type is all mountain bikes. These are very similar to the trail bikes but have a stronger frame and a little better suspension. Since these are a little heavier, they are a little more difficult to pedal. The third type of mountain bike is the downhill mountain bike. These are designed just for the people who just want to ride downhill. They are extremely fast and are great for steep hills. Since these are made to pedal hard and fast, the gears are high and they're large so they are easier to get to. In addition, the gears and frame are much more durable. Next, is the freeride mountain bikes. These are a lot like the downhill bikes but they aren't as heavy. The frame of this bike is more compact so they can be more easily moved while riding. The frame is also more flexible. The final type of bike is the dirt jump bikes. These ones are designed for those riders that want to jump big hills. They are lightweight and made to do awesome tricks in the air. The next thing you're probably wondering is how much to spend for a mountain bike and the guidelines of buying a mountain bike for beginners. There are a few things that will help you through this process. Remember, there are many different bicycle choices in different price ranges and you don't need to spend more than you have because you will find a decent MTB in your price range. Below are the different features that are usually available on the mountain bikes in the specific price range. 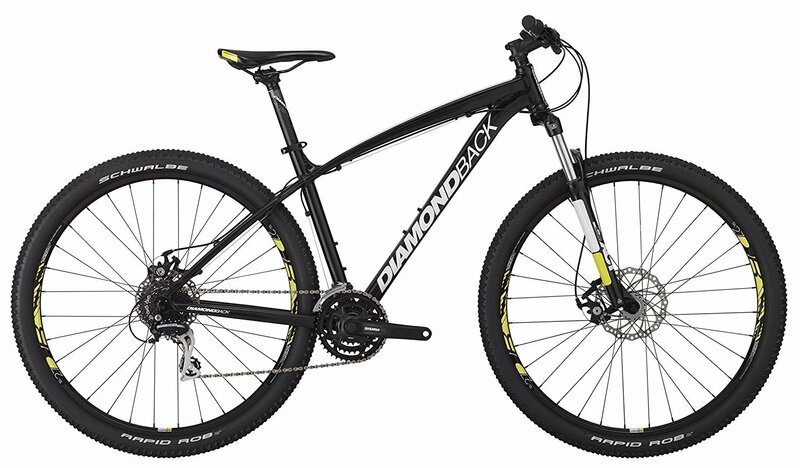 This will give you an idea on overall mountain bike in that price range. Remember, these are just the common features and some bicycles may have more features than another one. For this price, you're going to be getting a bike that has the bare minimum. While there are some great choices, if you're looking for a lot of features, then you're going to have to spend a little bit more. With that being said, there are a few features that you can count on having in this price range. While you might not get many gears or more high tech features, you will get the basic features, such as: front and back brakes and suspension on at least the front or back. The frame and wheels might also be made of cheaper materials. This price range gives you a little bit more selection but it's still pretty limited. With that being said, you can find a decent bike in this price range. You might just have to look a little harder to find one that's worth it. These bikes will have the basic features. They might be a little bit more advanced than cheaper choices but they are still going to be pretty simple. Remember, since the price is still low, you're going to want to avoid full suspension because you don't know how reliable it is since it's such a low price. This price range is right in the middle of budget-friendly and mid-range. With that being the case, you can get a really nice and decent bicycle. This is the range when the bikes really start having great features and are extremely reliable. Some of the features that you can look forward to at this price are: reliable full suspension systems, frames and wheels that are made of higher quality metal, and they have more speed settings than bikes that are at the lower price point. Keep in mind, you can also buy a bike in this range then upgrade to better and more expensive parts later on! This range will let you buy a bike that is high quality and has many features to choose from. These bikes also tend to last you much longer than others because they are made with metals that are much higher quality. This also means that the frame and wheels are going to last longer. These bikes usually have full suspension and brakes that will stop you as soon as you need it. 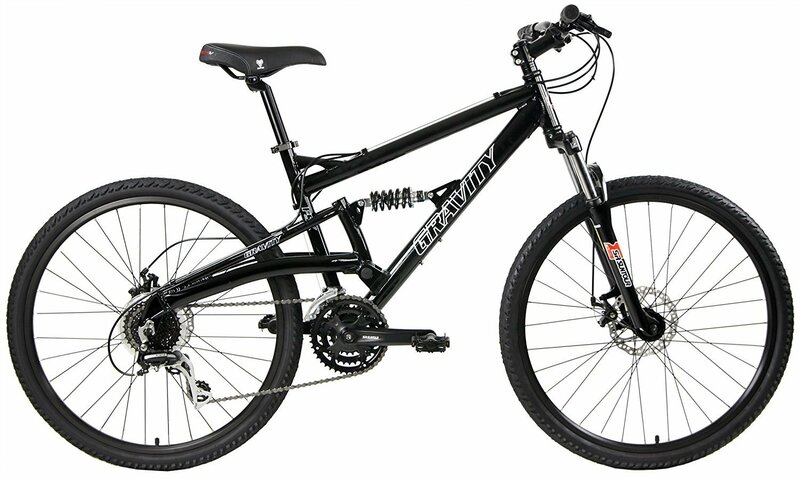 In addition, you will be able to find a mountain bike that has many speeds to choose from. That could be anywhere from 10 speeds to 33 speeds and you'll be able to choose pretty much any bike you want! There are a few important things to consider before buying a mountain bike for beginners. These tips will help you be able to buy a good quality bike that will last you awhile. It will also help you figure out which features are the best for you and your needs. The first tip has to do with whether you need full suspension or partial suspension. The way to figure this out is by evaluating what kind of terrain you will be biking in the most. If it's hard terrain with a lot of bumps, you'll want to get full suspension while easier terrain will do fine with just partial. The next tip is to make sure you get the type of mountain bike that goes with your biking style. For instance, if you are all about doing tricks, get a bike that will make this possible. The final tip is to get the wheel and tire size that fits you best. You need to make sure you get a size that will fit you well and be able to be easily maneuvered. The best way to tell is by actually sitting on the bike and making sure you fit well. There are many mountain bike accessories available but some are better than others. Some are must have products, while others are just a waste of money or giving a extra protection layer. Here we'll discuss which accessories are must have and worth the money. For starters, you want to make sure you have spare tubes just in case you have a blowout. You really don't want to be stranded. Next, you'll want to make sure you have a patch kit. These are great for those tubes that aren't completely ruined and need to be replaced. Another great accessory is a tire pump. You want to make sure you can pump up any flats, as well as any spares. The next accessory is a good multi-tool. This is so you can make any quick fixes you need without having to carry all kinds of tools. The next tool that is good to have is chain lube. You want to make sure you have lube in case your chain seizes up. The next accessories are ones that will help make the ride better and more comfortable. These are lip balm and sunscreen. The final few accessories that should be taken are: first aid kit, spare parts, and a small headlight. There are so many different mountain bike brands to choose from, but some are better than others. While some are great choices, there are some that are just top of the line. The best mountain bike brands are listed below. This brand has been around since mountain bikes started. They are so great because they don't stick to one design. Their main focus is to create bikes that will give the rider the best ride. Trek mountain bikes first appears in the seventies and now they are one of the best known brands. These bikes are known for being high-quality and having great endurance. While this is a pretty new company, they are very quickly becoming big. Not only are they well known for quality, but also bikes that help you have some of the best rides of your life. This is literally one of the best brands out there. One of the reasons for this is that they only offer mountain bikes and they are focused on quality and having designs that you can't find anywhere else. This company found their inspiration from Hawaii and has several different bikes to choose from. You can even go on their website and use a tool that will help you find the best bike for you! In conclusion, not only is mountain biking an awesome sport, but there are so many bikes to choose from. Remember to take the tips in this article to choose the bike that fits you the best. You also want to make sure that you find the bike that will fit your biking needs. If you are all about stunts then find one that is great for this. Another thing to remember is that there are many bikes in different prices points and you should be able to find a great one. Finally, make sure you take any accessories with you!